Colombia faces challenges exporting to the U.S. When the Colombian government signed a ceasefire agreement with the leftist rebel group FARC in 2016, this country of 45 million turned out to celebrate the end of 52 years of civil war. Those working in the produce industry were equally relieved, as farmers often found themselves and their livelihoods in the crossfire between rebels and government troops. Everyone across the country was ready to move forward. Two years later, the biggest aggravation for growers, distributors, and exporters are the hoops set up by the U.S. Department of Agriculture and its Animal Plant Health Inspection Service to get Colombian fruits and vegetables — it has long shipped bananas, plantains, and pineapples to various global trading partners — into the United States. Global Agricultural Trading, which has offices in Bogotá, as well as Encino, Calif., Canada, France, and South Korea, grows and exports nine different fruits of which only two — gooseberries and dragon fruit — are allowed into the United States. “There’s such a big concern with fruit flies,” says Robinson Martinez, co-owner of the company. To be able to export fruit to the United States, he says there are numerous protocols within a rigorous process. There is, of course, the upside: once the protocols are in place and working, exporters can ship product — albeit limited — to awaiting buyers in the United States. More good news surrounds one of the world’s hottest commodities — avocados — and their acceptance into U.S. ports. 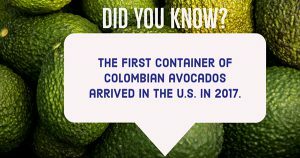 In August 2017 after more than 10 years of negotiations, Colombian Hass avocados were approved for export to the United States and, in November 2017, the first container arrived at the Long Beach port in California. Since then, Colombia has increased production to more than 65,000 hectares (from 23,000 in 2010) and has shipped nearly 64 million pounds of avocados to the United States. Until its entry into the U.S. market, Colombia was exporting nearly 40 percent of its avocado crop to the European Union. Top import markets included Belgium, France, Germany, Ireland, Italy, the Netherlands, Portugal, Spain, and the United Kingdom. It also shipped avocados to Panama. That said, Canada is also a popular market for Colombian produce. According to Martinez, doing business in Canada is easier and less hamstrung by strict protocols.